The film festival in Ivanovo called Zerkalo because it reflects contemporary independent cinema and tries to understand its origins more deeply. Source: ITAR-TASS. 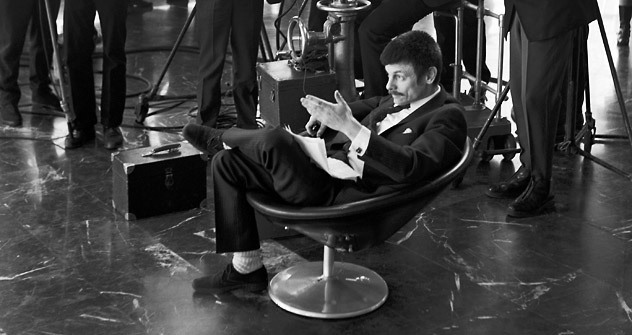 The personal effects of director Andrei Tarkovsky are up for auction and expected to sell for up to $158,730. A letter to Brezhnev, film scripts, frame-by-frame descriptions of movies, photos with Rostropovich and others – all are to go under the hammer at Sotheby’s at the end of November. The Ivanovo regional authorities (founders of the Andrei Tarkovsky International Film Festival) are seeking extra-budgetary funding in order to purchase the director’s personal archives. The film director’s personal effects are to go under the hammer on Nov. 28 at Sotheby’s in London, where they are expected to fetch between $126,980 and $158,730, head of Ivanovo Region Press Service, Oleg Rakitov, told RIA Novosti. The archives have been put up for auction by Olga Sokurova, a film historian and student of Tarkovsky. Sokurova co-authored the book “Sculpting in Time,” in which the director talks about his films, as well as cinema and art in general. The archives include material relating to the director’s personal life and his professional career. Ivanovo Region Governor Mikhail Men sent a Twitter message to his staff, requesting that they begin the search for funds with which to make a bid for the archive. “The Department of Culture enjoyed a close relationship with Tarkovsky’s family – particularly with his sister Marina. We are in discussions with our partners at the Zerkalo International Film Festival about extra-budgetary funds to purchase the Tarkovsky archives. We hope we can keep Tarkovsky’s archives in Russia,” the press agency’s contact said. One of the most interesting items for bid in the lot is a letter to Leonid Brezhnev, in which Tarkovsky sought permission to work in the Soviet Union and show his banned films in his homeland. Among other items up for sale are notebooks containing frame-by-frame annotations of his films, printed screenplays that differ from their final versions, and 32 audio tapes of discussions with the director. Tarkovsky’s personal photo albums include pictures of the director with his family and friends, as well as with other famous personalities, such as renowned cellist Mstislav Rostropovich. The Andrei Tarkovsky International Film Festival Zerkalo (“Mirror”) has been an annual event in Ivanovo Region since 2007. The current chairman of the festival is the well-known film director Pavel Lungin. An event called “The Days of Andrei Tarkovsky” is held in celebration of Tarkovsky’s birthday in April, in the small town of Yuryevets (Ivanovo Region) where the director was born. This past April, the week-long event included lectures and talks, exhibitions and film screenings, along with book launches. A Tarkovsky House museum was opened in 1996, in the building where the director spent his youth.